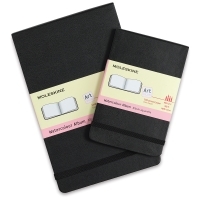 The latest addition to the classic hardcover Moleskine line of notebooks is for the watercolor artist on the go. 200gsm, 25% cotton cold pressed, watercolor paper is thread-bound to the Moleskine textured covers. An inner pocket holds notes and the elastic band on the short side keeps book securely closed.